Rubbish, garbage, litter, junk, scrap, trash. Waste is generated in various forms. Managing it is one of the essential services that municipal authorities are duty-bound to provide. Putting waste into a vehicle and unloading it at a dump seems to be a simple enough affair. Then why do so many cities and towns across the globe suffer from rotting refuse piled up in streets and drains–breeding flies and rats, and degrading urban environments? Wait a minute. What is waste? According to the Oxford dictionary, waste is anything that has been discarded as no longer useful or required. So, let us relook at the definition ‘discarded as no longer useful’ would mean that the resource has lost its value to you, though not necessarily to the next person. After all, everything in this universe is made up of the basic 109 elements of the periodic table, or the five elements referred to in the Hindu scriptures. But what makes a material useful or waste is the way mankind blends these essential elements together. What you are calling waste today has one or the other of the elements which if recovered would no longer be called waste. The human race doesn’t consume everything it produces. Most of what is produced finds a place in dumping sites rather than being reduced, reused, recycled or recovered. Indian society wastes even things that can be very easily returned to nature. The most common example would be organic waste. It is waste only because few bother to make compost out of it. The prevailing attitude is just leave it aside, or better still, dump it on the waste-hills of your city and call it waste for another 30-40 years until a fancy rock garden is made over it. But the poor resource shall always be called waste! As per official estimates, India produced 127 million kg of municipal solid waste per day in 2011-12. The actual amount could be much more. The World Bank estimates that solid-waste generation in India will rise by 243 per cent between 2012 and 2025. Sadly, at least 40 per cent of the waste going to landfills is easily compostable, with kitchen waste accounting for 50 per cent of household waste in the country. After years of is management, the government is now revising rules and manuals to deal with the growing solid waste and incorporating a large army of ragpickers and waste-dealers in the formal system. There are only two ways we can deal with this growing mountain of filth: by reducing our waste by using less, and by separating the waste so that we can recycle, reuse and compost as much as possible. According to the Central Pollution Control Board (CPCB), 70 per cent of the total solid waste in the country is collected and only 12 per cent is treated. Segregation at source, collection, storage, treatment and scientific disposal of waste are insufficient. According to the municipal Solid Waste Rules 2016, the emphasize is on segregation of waste into three categories at the source by the waste generator (refer to Diagram: Categories of waste). Storage at the source of waste generation is the first essential step towards appropriate waste management. But in most urban areas, existing facilities are inadequate and practices shoddy. Domestic/trade/institutional waste: Most households, shops and other establishments throw waste out on the street. Those who use community dustbins provided by local bodies often throw the junk around the bin rather than into it. Most of the trash remains on the roads and public spaces. Biomedical waste: This waste contains a variety of infectious and toxic wastes generated by hospitals, nursing homes and healthcare centres. It can have a potent impact on human health if it is not disposed of scientifically. But in most urban areas, no facility exists for the safe disposal of such waste. It gets mixed with domestic waste and is finally deposited at domestic disposal dump sites. Industrial waste: Factories located within city limits produce large volumes of hazardous and non-hazardous wastes that are required to be disposed of by the industry, following standards laid down by Pollution Control Boards at designated sites. This does not happen in practice. Waste is dumped surreptitiously on open plots or roadsides or in water bodies, causing environmental pollution and sub-soil contamination. People do salvage reusable or saleable material, such as newspaper, glass bottles, empty tins, plastic bags and old clothes from waste and sell it for a price. However, a lot of recyclable dry waste, such as waste paper, broken glass, metal and packaging material, is not segregated and is thrown on the streets along with a mixed load of trash. Collection of waste is the most important component of Solid Waste Management (SWM) services. But this aspect is grossly neglected in India—primitive and inefficient systems continue to be used. There is no arrangement for house-to-house collection of waste, except in a few residential areas where private arrangements exist on a payment basis. Community bins are not available either at convenient locations. In the absence of any structured system, street sweeping is the only method left for primary collection. 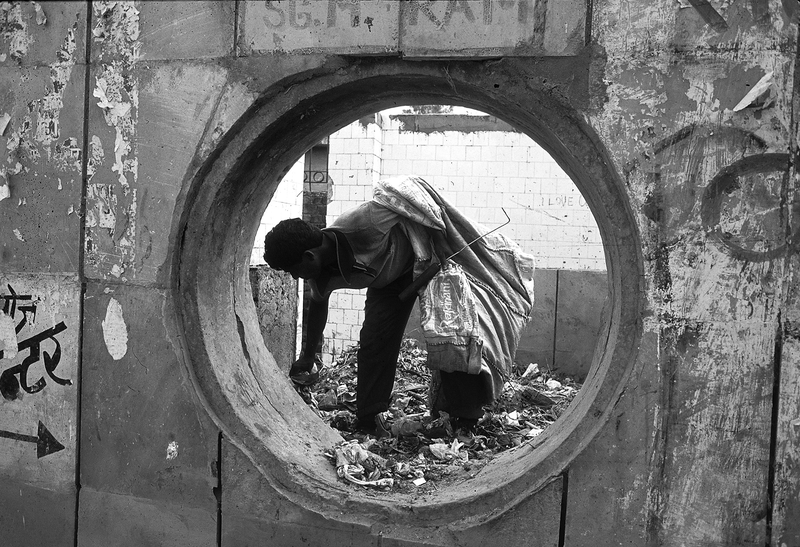 In India, waste is mostly dumped without the principles of sanitary landfilling in view. As there is no segregation at source, all waste, including infectious medical waste and industrial refuse, finds its way to the disposal site. It is deposited in low-lying areas, quarry pits or roadsides and no prior testing is carried out to check soil permeability or lining. Waste is neither compacted nor properly covered. It remains exposed, emitting foul smell and fumes. Dump sites breed rats and flies and attract stray dogs and cattle. They also endanger underground-water resources as they cause subsoil water contamination. Reduce Consumption: All products that we use become waste at some point in time. Therefore, it is very important to pause to think whether you really need the product. Think twice before your purchase. E-waste is one of the fastest growing waste streams in India, with a growth rate of 10 per cent per annum. The generation of e-waste is increasing exponentially every year. The growth can be attributed to globalization of the economy that makes electronic products an integral part of our lives. Also, India’s low manufacturing costs, skilled labour, raw materials, availability of engineering skills and opportunity to meet demand in the populous Indian market have contributed significantly to facilitate the growth of the electronics industry. Thus, e-waste management has become an immediate as well as long-term concern as its unregulated accumulation and recycling can lead to major environmental problems endangering human health. It is obligatory for urban local bodies, under the laws that govern their administration, for them to arrange for street sweeping and disposal of solid wastes. But there are no legal provisions to make it compulsory for urban local bodies to provide community-based collection or to make it mandatory for the people to organize proper storage of waste at home. The management of solid waste has remained neglected in the country since Independence. It has never caught the attention of decision makers. Institutional arrangements for solid waste management are haphazard and at best ad hoc even now. There is a whole culture of waste management that needs to be put in place—from the micro level of the household and neighbourhood to the macro levels of city, state and nation. This is possible only if waste producers, i.e. those who live in cities, cooperate and participate in the waste management efforts of local bodies. People desire a better quality of life. But, at the same time, they ignore the facilities already provided by urban local bodies and litter streets and throw waste anywhere and everywhere. Collection and processing of waste need not be the exclusive domain of the local government. The order of the day is clearly a more comprehensive partnership between the community and local governments, where each waste producer has a role to play towards waste minimization, recycling and disposal. Schools can provide excellent educational opportunities for creating awareness about waste and its management. Waste reduction initiatives save natural resources, energy and landfill space. Reducing, reusing, recycling and waste material will improve the economic and environmental performance of the school. The school’s waste management programme has the potential to transform the school environment into a laboratory for learning. It also provides numerous opportunities for the students to understand this issue and its implications on the local environment. There is nothing that should be known as waste—waste is just a misplaced resource. Ideally, your school should not generate any waste. But there is waste, as most human activities result in some waste. Wastes are of many types, such as biodegradable and non-biodegradable, hazardous and non-hazardous, etc. Each of these categories has to be handled carefully. Please wear gloves and masks while handling waste. E-waste should be handled by adults. Arrange a meeting between the student audit team and the key people in your housekeeping staff. Let the students describe the project with them. Segregate all waste, put them into packets or bags and weigh each kind of waste using a spring balance. If the practice of segregation of waste has already been adopted, then it will be easy to find out the amount of waste paper and other common trash. For silt and soil, put a small mesh wire under the dustbin and find the amount collected beneath. Alternatively, pour the waste on a mesh, so that the dust and silt passes through and then weigh the silt. Waste segregation: Segregation means sorting. Let us understand the waste segregation system because the amount of waste recycled or reused will depend on the method of collection. Collection point: The areas where dustbins have been placed such as classrooms, staffroom, playground, etc. Students will have to count the number of waste disposal or collection points in the school and then count the number of dustbins in each of the collection points. Eg: one dustbin in staffroom, two dustbins in the playground will be counted as a total of three dustbins and two collection points. Find out whether your school has any waste recycling facility, such as a compost pit or paper recycling machine. If you have a paper recycling unit, the person in charge will definitely be recording the input and output from the unit. 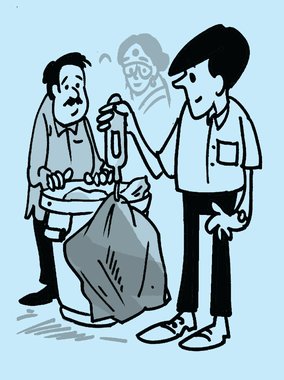 If the school is selling newspapers or bottles or metal scrap to the local waste dealer (kabadiwala), that can also be included in the quantity recycled. Turn your spoils into soil. How? Read on to figure out. Growing concerns relating to waste generation and its quantity have rekindled the school community’s interest in organic recycling practices like composting. The potential of composting to turn on-campus waste materials into a school resource makes it an attractive proposition. It offers many benefits to school campuses, such as improved soil fertility and soil health, thus increasing productivity and improving soil biodiversity—and contributing to a better environment. Even though the practice is popular, schools in many parts of the country, to their loss, do not make the best use of organic recycling. This may be due to inadequate knowledge, the idea that composting is labour and time-intensive and the economical aspects involved. Step 1: A 9-foot long (L) x 5-foot wide (W) x 3 foot high (H) pit is prepared (1 foot = 30 cm). The pit is partitioned into three equal parts of which two parts are filled and third part is left empty for turning. Step 3: Only two parts of the pit is filled layer by layer up to the height of 4 feet, keeping the third part empty for turning. After filling, the tank is sealed with a 3-inch-thick layer of soil covered with cow dung and mud plaster. The process of composting is accelerated by turnings, whereby aeration, mixing of composting materials and moistening is done (if necessary). This results in almost total decomposition of the matter, yielding brown homogeneous compost in about three months. The average nutrient content of compost prepared by this method is 0.8 per cent nitrogen (N), 0.3-0.5 per cent phosphorus pentoxide (P2O5) and 1-1.5 per cent potassium oxide (K2O). This method of composting, however, demands considerable labour in building up the heap/pit to a proper shape as well as periodical turnings, rendering it impractical and expensive where large quantities of materials have to be processed. A major disadvantage of this process is the heavy losses of organic matter and nitrogen (40-50 per cent of the initial).  Try to compost horticultural waste first.  Do NOT add cooked food into the pit. Also, avoid bones, dairy products, and meats that may attract pests and rodents.  Add vegetable and fruit peel only.  Do NOT add newspapers and other printed waste.  Limited amounts of citrus can be added.  Do not add any chemicals: no metals, plastics, glass, soaps.  Grinding or blending the food waste in a food processor speeds the composting time considerably.  Dry waste—paper and plastic— should be given to local scrap dealer.  E-waste should be handed over to an authorized dealer.